After nearly two weeks of play, Scott Blumstein of Morristown, New Jersey has won the 2017 World Series of Poker (WSOP) Main Event. Along with the prestige of being World Champion, Blumstein pockets a staggering $8,150,000 and the championship bracelet. Blumstein seized the chip lead on Day 7 and kept the pressure on his opponents the whole way, leading nearly wire to wire. Heads-up play would come down to Blumstein and Daniel Ott , another young poker pro from Pennsylvania, both players 25 years old respectively. Even though Blumstein held a large chip lead, he would still need to hit a three outer on the river of the final hand to close out Ott. On the final hand of the tournament, all in pre-flop, Blumstein held A♥ 2♦, while Ott was out front holding the A♦ 8♦. The board ran out J♠ 6♠ 5♥ 7♥ 2♥ giving Blumstein (pictured below) the championship in dramatic fashion. Blumstein is a graduate of Temple University and completed a degree in accounting before becoming a professional poker player. Prior to this score he had $312,142 in live tournament earnings, as well as over $150,000 in online poker cashes. 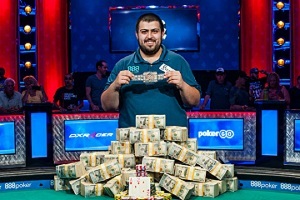 With the win Blumstein also receives a €10,350 Main Event seat at the World Series of Poker Europe (WSOPE). This year’s WSOPE will be held in the Czech Republic beginning in late October, and features 11 bracelet events.